Japan Arts Connection Lab (JACLab) will be bringing Noh + Opera as well as Jiuta (“Music of Kyoto’s pleasure quarters”) performances to Seattle audiences. This year, there will be a goodwill visit to Seattle by the Chief Court Musician of Japan’s Imperial Household Agency, Hiroaki Tohgi. He will be presenting through the week of May 4-8, 2015 at various locations in the city. The free presentations will provide demonstrations and lectures on a very little known area of Japan’s rich cultural history. 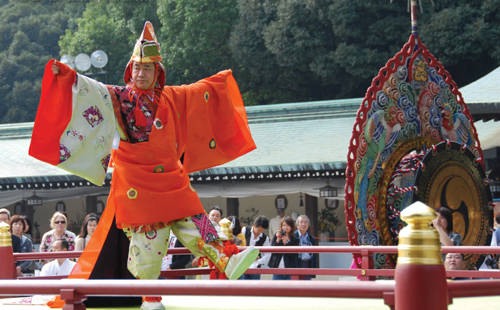 Gagaku (literally, “elegant music”) refers to Japan’s court music and dance. It is the oldest continuously practiced tradition of classical music in the world, with sounds and rhythms that blend Silk Road traditions with indigenous Japanese cultural arts. Gagaku dates back to the 700s (Heian-era Japan) and made its debut on the international stage only 55 years ago in New York at the United Nations’ General Assembly Hall. Since then only seven U.S. cities have had the privilege of a visit by the Imperial Household Agency’s Gagaku ensemble. With the sponsorship of the Consulate General of Japan in Seattle, Tohgi will offer a rare glimpse into this highly evolved performance genre to Seattle audiences with a general or academic interest in Japan’s history, music, art, and culture. LECTURE, Allen Library Auditorium, University of Washington. Lecture on Japan court life. LECTURE & WORKSHOP, Brechemin Auditorium, School of Music Building, UW. Lecture and workshop with the chance to try a short piece as an ensemble. A special reception with Mr. Tohgi will be held immediately after the event for guests and donors to JACLab’s Gagaku fundraiser, with appetizers donated by “4649 – Yoroshiku” and “Tengu” Japanese restaurants. DEMONSTRATION co-presented with Gardner Center for Asian Art & Ideas, Asian Art Museum in Volunteer Park. Demonstration of Gagaku music and dance, with authentic costumes and instruments hand carried from Japan. For more information visit http://www.jaclab.org. Japan Arts Connection Lab’s mission is to share the beauty of Japan’s traditional arts and culture, help demonstrate their universal value, and facilitate their transmission to the next generation. Hello there, fantastic helpful post! I am an author and very thrill With your presentation of thoughts and concepts in our market. Sustain the great work. Do you have a facebook page?